When you enjoy a meal at Frontier in Brunswick you also get to enjoy the view. 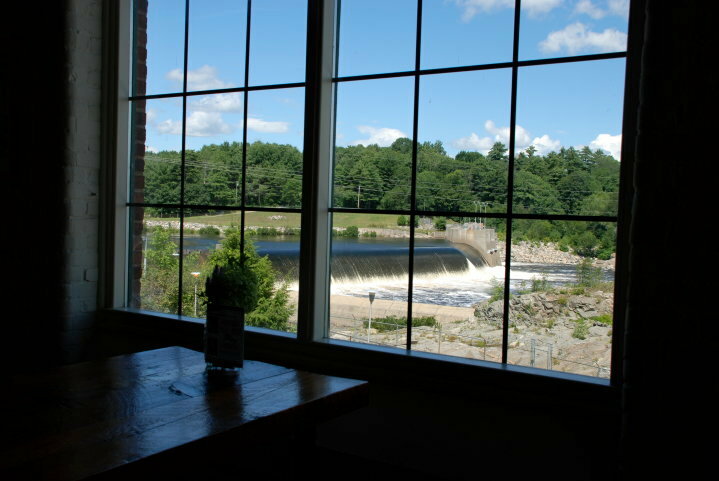 The cafe (and cinema and art gallery) are located in Cabot Mill on the site of Fort Andross on the banks of the Androscoggin River. Fort Andross was built in 1688 and served as a trading post for fur trappers. It was also a garrison during King William’s War. The mill was built in 1809. The power of the river at Pejepscot Falls was harnessed to make yarn in Maine’s first cotton mill. In 1857, the mill was expanded and rebranded as the Cabot Manufacturing Co.
Noly Lopez is the food and beverage manager, which means he is in charge of serving up delicious meals. He says he’s been cooking professionally for 15 years and has been in a leadership “chef” role for eight. Why do you think food and cooking are so important? I could give you a few hundred pages on why food and cooking are so important. The shortest answer I could possibly give would be that cooking is a means to transform food in a way that nourishes our senses and our bodies. The more you cook, and the better you cook, the more you honor your mind and body. How does Frontier approach food differently than other places? Frontier’s approach to food can be eclectic and sometimes hard to define. However, it always starts with fresh, high quality ingredients sourced as close as possible. Collaboration is a massive part of the kitchen at Frontier and has allowed us to create recipes and dishes that pull from a wide range of palates and leaves us with a product that is dynamic and creative. What one tip can you offer home cooks? Taste, adjust, and taste again! Vinegars, salt, open your mind! This recipe, while containing a few elements that require planning ahead, can be easily modified and the ingredients can be easily substituted. Prepared cabbage slaws, and kimchi can make this a minimally prep intensive recipe. However, the cabbage and kimchi elements of this recipe can also be used for other recipes or enjoyed on their own. I say, let’s give it a try! And thank you, Noly and Frontier, for the recipe. Pollock is a sustainable Maine option that we use at Frontier. Other white fish can be substituted as needed or desired. Cut fish into pieces approx 2” x 1”. In a small dish add the 4 oz of rice flour and 1 t. salt. Thoroughly coat fish with flour and set aside. In a small pot, heat 4 cups canola oil to 375F. Put the fish in one piece at a time and let cook until golden brown, approximately 2 minutes. Remove fish, and season with 1 T. salt immediately. Thinly slice red cabbage and combine with all other ingredients. Let sit for at least 4 hours, but preferably overnight to fully marinate. Mix the napa cabbage with the salt and sugar (to cure) and let sit for at least 4 hours, but preferably overnight. Combine all other ingredients while the napa cabbage cures. Puree 1/2 cup of finished kimchi and mix with 1 cup of mayonnaise. This Kimchi recipe can be enjoyed fresh. It can be stored, under refrigeration, for up to 6 months. Grill or toast tortillas until warm and pliable. 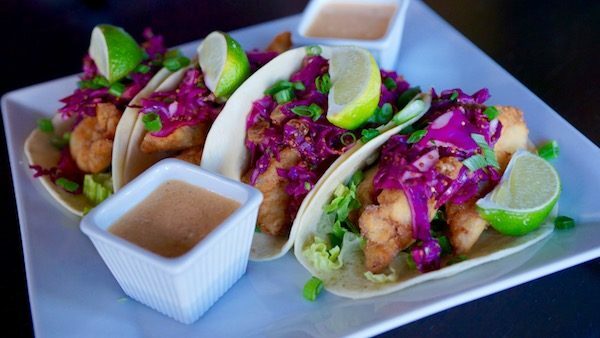 Place red cabbage slaw on tortillas, line up fried fish over slaw covering the entire length of taco shell. Spoon on approx 2 T. of kimchi remoulade per taco.